In an effort to begin posting here a little more often than once every few months (call it a desire beginning in 2009, but something short of a resolution), I thought I’d lower the bar for creativity a little bit and see what happens when I don’t feel the need to write something important. We’ll see how it goes, and I hope my few remaining subscribers will appreciate the updates. If not, I can’t imagine I have many more readers to lose at this point, and I figure having anything current to read on the front page is better than months-old content. Either way, I feel the need to get my writing juices going again, so even if it’s just for me, I figure it will be worth doing. 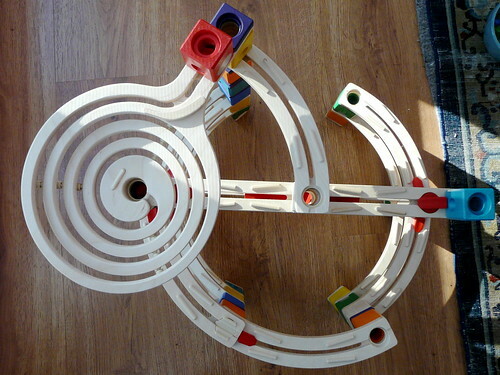 This Twist & Rail marble run from Quadrilla (a difficult-to-navigate site, because it’s primarily German) is one of the more versatile sets you can get (others sets include just Twist, just Rail, Basic, and several Expansion kits), and it provides hours and hours of fun, including both setup and actual “play.” I highly recommend it to anyone, with or without kids, but it makes an especially great toy for parents and kids to share. The construction is complicated enough to require adult help (or at least an older child working alone), but it provides a bigger feeling of accomplishment as well when it’s time for the marbles to start rolling. 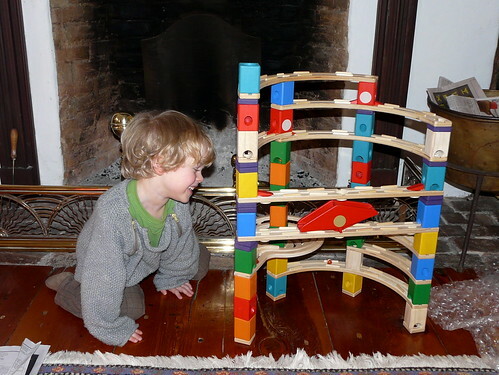 The building and the anticipation really ends up being exciting for even the most impatient of kids (based on a sample of one, granted, but I think it’s fairly representative), and it’s a much more active and stimulating game than many, many others I can think of. 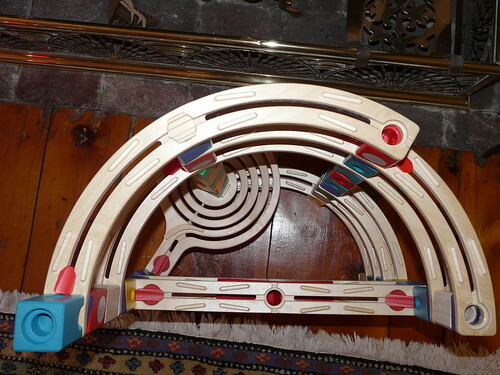 As a nice bonus, the components are all sturdy and well-constructed wood pieces (similar in look and feel to the fine Melissa & Doug toys), which makes them durable (helpful for when a run gets knocked down, which is not infrequent) and attractive enough to keep you from feeling ashamed when leaving them set up in your living room for days (as I’ve been doing lately without complaint in the household). I’m back to work tomorrow, which I guess means that my son will be getting some of his new toys back. In the meantime, does anyone know of any additional proven designs? I’ve executed all the ones that came with the instruction booklet for the set, but I don’t have the expertise to wing it with new creations just yet.